San Diego, CA — Long-simmering social tensions in Mexico are threatening to boil over as failing neoliberal reforms to the country’s formerly nationalized gas sector are compounded by open corruption, stagnant standards of living, and rampant inflation. 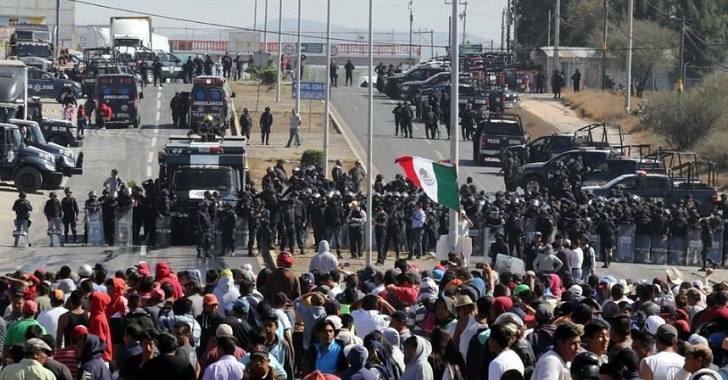 The U.S. media has remained mostly mute on the situation in Mexico, even as the unfolding civil unrest has closed the U.S.-Mexico border in San Diego, California, several times in the past week. Ongoing “gasolinazo” protests in Mexico over a 20 percent rise in gas prices have led to over 400 arrests, 250 looted stores, and six deaths. Roads are being blockaded, borders closed, and government buildings are being sacked. Protests have remained relatively peaceful overall, except for several isolated violent acts, which activists have blamed on government infiltrators. The narco-state, or as Mexican activists say, “el narco-gobierno,” is a term used to describe the open corruption between the Mexican government and drug cartels. The narco-state has been in the headlines lately over the kidnapping and presumed murder of 43 Ayotzinapa students in Iguala, Guerrero, in 2014. This has been a source of continuous anti-government protests ever since. Though the kidnappings remain officially unsolved, members of the Guerrero Unidos drug cartel have admitted to colluding with local police forces to silence the student activists. Twenty police officers have been arrested in association with the kidnapping. Former Iguala police chief Felipe Flores has been arrested and “accused of offenses including organized crime and kidnapping the students,” the AP reports. The corruption apparently goes all the way to the top, as federal authorities say former Iguala mayor José Luis Abarca personally ordered the kidnappings. Much like the U.S., the Mexican government is susceptible to corporate influence. It just so happens that the most influential corporate entities in Mexico are drug cartels — and it’s hard for the government to reign in entities that fund and infiltrate it. Similar to the phenomenon of “regulatory capture,” the Mexican government is at least partially funded and co-opted by drug cartels. This festering problem is an underlying factor in the current civil unrest in Mexico. NAFTA was a contentious issue in the 2016 U.S. presidential election, but it’s just as controversial in Mexico, if not more so. The grand 1994 “free trade” scheme, signed into law by Bill Clinton, saw a dramatic redesign of both the U.S. and Mexican economic landscapes. Corn farmers, long a vital factor in Mexico’s peasant farming economy, were wiped out by low-priced corn subsidized by the U.S. government, which immediately flooded Mexican markets after NAFTA was passed. The Mexican immigration crisis at the U.S.’ southern border soon followed. Meanwhile, manufacturing plants soon began moving into Mexico from the U.S. to take advantage of extremely cheap labor — leaving many workers in the U.S. out of a job. American agricultural corporations like Driscoll’s have recently come under fire for employing slave-like labor conditions to produce boutique organic fruit for U.S. consumers. Protests for workers rights in Mexico, which recently raised its minimum wage to 80 pesos (~$4) per day, are often met with heavy-handed police crackdowns. Incoming President Trump has capitalized on two issues caused by NAFTA — the immigration crisis and outsourcing of U.S. jobs — and his reactionary protectionist economic policies will undoubtedly make Mexico’s predicament even worse. Mexico’s nationalized oil conglomerate, Pemex, has been plagued by falling production for years. Corruption, which is inherent to state-run institutions, has condemned Mexico’s gas industry to inefficiency and stalled innovation. Theft has become a widespread issue, and oil workers were recently caught red-handed siphoning gas directly out of pipelines. Supposedly to ramp up production and lower prices, the Mexican government pushed through neoliberal privatization schemes in 2013 and 2014, which were backed by U.S. oil interests and incubated by the Hillary Clinton-run State Department. President Enrique Peña Nieto promised the reforms would result in increased production and lower fuel prices, though production has fallen and prices spiked 20 percent on January 1st. Prices are expected to rise even further, as fuel subsidies will be completely phased out by March 2017. Peña Nieto claims the prices must go up to match international prices, though consumers in the U.S. currently pay less for gas than Mexicans. Peña Nieto’s neoliberal reforms have fallen flat as economic growth has been anemic for years and wealth inequality has grown out of control. Perhaps the biggest driver of the current civil upheaval in Mexico is out of control inflation coupled with the value of the peso reaching record lows. Mexican workers are already stretched thin financially as minimum wage hovers at four U.S. dollars per day. Food prices, which were on the rise before the gas price increases, are set to climb 20 percent or more as they correlate closely with prices at the pump. According to Zero Hedge, in Mexico, it currently takes “the equivalent of 12 days of a minimum wage to fill a tank of gas — compared to the U.S.’ seven hours.” People who don’t drive will also feel the pain, as public transportation costs are likely to rise with fuel prices. Rising gas prices also put downward pressure on the rest of the Mexican economy as workers spend more money on gas and less on consumer goods. The Mexican government’s deficit spending and Trump’s tough talk on trade have been factors in devaluing the peso, making everything in Mexico more expensive for the working class and driving the general discontent that makes the country a hotbed of unrest. Overall, no one factor can be blamed for causing extreme levels of unrest in Mexico. Before the Ayotzinapa student kidnappings, Mexico was already seeing widespread protests, marches, and strikes. The last several presidential elections have been contested, and the current administration of Enrique Peña Nieto has only a 22 percent approval rating. The general feeling of helplessness in the face of narco-state corruption and economic insecurity is not going away with the next election or protest, and wealth inequality in the country is beyond remedy. Mexico is ripe for revolution. Whether it’s triggered now by the gas gouging and subsequent inflation or in the near future, it’s coming — and we should be talking about it. This article (Protests in Mexico Push Country to Brink of Revolution and Nobody’s Talking About It) is free and open source. You have permission to republish this article under a Creative Commons license with attribution to Nick Bernabe andtheAntiMedia.org.